To evaluate the efficacy and safety of abiraterone acetate (AA) plus prednisone compared with prednisone alone in Asian patients with chemotherapy-naive metastatic castration-resistant prostate cancer (mCRPC), and to identify predictive factors. We reviewed the medical records of 60 patients with chemotherapy-naive mCRPC at Renji Hospital who were treated with AA plus prednisone (n = 43) or prednisone alone (n = 17). All patients were assessed for prostate-specific antigen (PSA) response, PSA progression-free survival (PSA PFS), radiographic progression-free survival (rPFS), and overall survival (OS). The ability of several parameters to predict PSA PFS, rPFS, and OS was studied. The median follow-up time was 14.0 months (range 7.0–18.5 months), at which time 19 death events had been reported: 11 in the AA + prednisone group and 8 in the prednisone group. The AA + prednisone group had significantly longer median PSA PFS (10.3 vs 3.0 months, P < 0.001), rPFS (13.9 vs 3.9 months, P < 0.001), and OS (23.3 vs 17.5 months, P = 0.016) than the prednisone-alone group. The most frequently reported grade 3 or 4 adverse event in both the AA + prednisone and prednisone-alone groups was elevated alanine aminotransferase level in 5 of 43 patients (11.6%) and 2 of 17 patients (11.8%), respectively. No adverse events led to discontinuation of therapy. In multivariate analysis, time from androgen deprivation therapy (ADT) to castration resistance of ≤18 months was a determinant of shorter OS (P = 0.007). These results support the favourable safety and efficacy profile of AA for the treatment of Asian patients with chemotherapy-naive mCRPC. Longer duration of ADT response was significantly associated with longer survival. Prostate cancer (PC), particularly metastatic castration-resistant prostate cancer (mCRPC), accounts for a large proportion of the global cancer burden . Although most men with PC initially respond to androgen-deprivation therapy (ADT), the response is not sustained and almost all patients eventually progress to a lethal castration-resistant phenotype within 18–24 months . Chemotherapy has been the standard treatment for mCRPC since 2004 [3–5]. More recently, the treatment paradigm had been dramatically altered by the advent of several AR pathway-targeted agents, new-generation chemotherapies, and immunotherapies . Abiraterone acetate (AA) is a potent and selective inhibitor of CYP17, a key enzyme in androgen biosynthesis . AA blocks the transformation of cholesterol to androgens in the testicles, adrenal glands, and tumor, which reduces serum testosterone to undetectable levels [7–9]. The COU-AA-301 and COU-AA-302 trials demonstrated a significantly increased median overall survival (OS) of patients with ECOG-PS (Eastern Cooperative Oncology Group performance status) scores of 0 or 1 when treated both after and before chemotherapy with AA compared with placebo [10–13]. 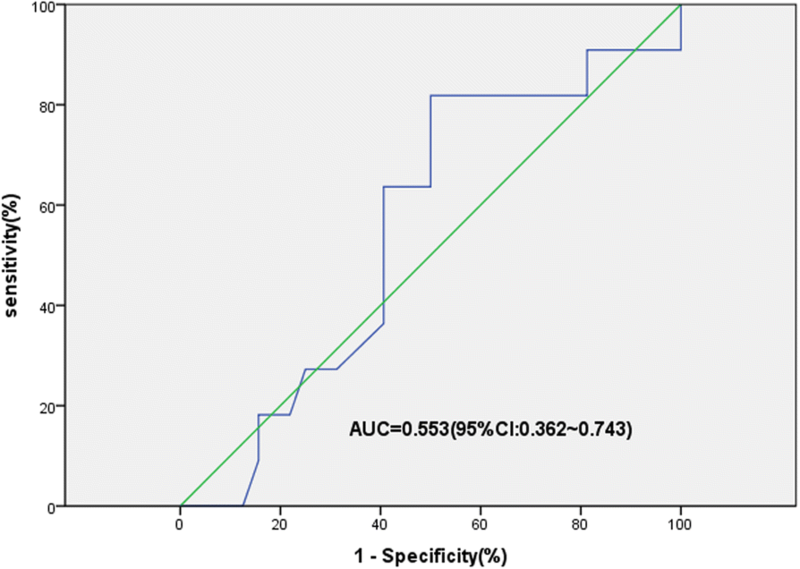 Currently, AA is not commonly used in clinical practice in Asian countries, and little is known about the clinical outcomes of Asian populations with chemotherapy-naive mCRPC treated with AA in real-world clinical practice. Moreover, AA is usually used to treat patients whose ECOG-PS is 2 in clinical practice, unlike the setting of previous clinical trials that included only patients with ECOG-PS of ≤1 [10–13] . In addition, the response rates to AA are currently unpredictable. Thus, the ability to accurately predict response to AA would facilitate clinical decision-making, especially if alternative treatments such as chemotherapy are being considered. In the present study, we evaluated the efficacy and safety of AA in the treatment of chemotherapy-naive mCRPC patients (ECOG-PS ≤2) at our centre in China and analysed factors predicting the outcome. Sixty chemotherapy-naive mCRPC patients have written consent and were enrolled in our study between September 2012 and March 2016. We have calculated the sample size of this study based on the previous similar studies [15, 16]. Approval for this study was obtained from the Committee for Ethics of Renji Hospital. Of the 60 patients, 43 have received AA and prednisone and 17 have received prednisone alone. These patients were consecutively enrolled in this study. Briefly, eligibility criteria were age ≥ 18 years with histologically or cytologically confirmed adenocarcinoma of the prostate; prostate-specific antigen (PSA) progression in accordance with Prostate Cancer Clinical Trials Working Group 2 (PCWG2) criteria or radiographic progression in soft tissue or bone with or without PSA progression; ongoing ADT with a serum testosterone level of < 50 ng/dL (1.7 nmol/L); previous ADT followed by PSA progression after discontinuing the anti-androgen therapy. Patients who had received therapy with ketoconazole for more than 7 days were excluded. Patients in the AA + prednisone group received AA 1 g orally twice daily (administered as four 250 mg tablets) plus prednisone 5 mg orally twice daily. Patients in the prednisone-alone group received prednisone 5 mg orally twice daily. Radiographic examination with computed tomography and bone scanning were performed every 8 weeks for the first 24 weeks and every 12 weeks thereafter. Clinical safety assessments included laboratory monitoring of blood chemistry, haematological values, kidney function, serum lipids, and PSA at baseline and at monthly visits thereafter. The definitions of PSA and radiographic progressive disease were in accordance with the PCWG-2 criteria . The co-primary end points were PSA response rate (proportion of patients achieving ≥50% PSA decline according to Prostate Specific Antigen Working Group criteria), PSA progression-free survival (PSA PFS), radiographic progression-free survival (rPFS), and OS. OS was defined as the time from the first dose to the last follow-up (March 2016) or death. PSA PFS and rPFS were defined as the time from first dose to PSA progression or radiographic progression, respectively, as previously described , or the time to last follow-up or death. Clinical assessments were conducted at monthly visits and included medical history, vital sign measurements, physical examination, review of concomitant therapy and procedures, and review of adverse events (AEs). The cut-off date for analysis was 17 March 2016. At that time, there had been 11 deaths in the AA + prednisone group (25.58%) and 8 deaths in the prednisone group (47.06%). The median follow-up time was estimated by the Kaplan–Meier method, with death as a censoring event. Continuous variables, except time from ADT to castration resistance, are reported as the medians with interquartile ranges (IQR) and were analysed by the Wilcoxon signed rank test. The time from ADT to castration resistance was dichotomised by calculating the area under the receiver operating characteristic (ROC) curve to identify the optimal cut-off time. Categorical variables were analysed by chi-square tests. Survival distributions, including PSA PFS, rPFS, and OS, were estimated by the Kaplan–Meier method, and treatment differences were compared using the log-rank test. X2-test was used to compare group differences in PSA response rates. An exploratory multivariate analysis for OS, PSA PFS, and rPFS was performed using the Cox proportional hazards model, adjusting for known baseline prognostic factors. All tests were two-sided. Differences were considered to be statistically significant at P < 0.05. SPSS version 19.0 software was used for all analyses. Sixty patients diagnosed with chemotherapy-naive mCRPC at Renji Hospital between September 2012 and March 2016 were enrolled (Raw data was shown in Additional file 1). At the time of follow-up, treatment was ongoing for 20 patients(46.5%) in the AA + prednisone group and no patients (0%) in the prednisone-alone group. The main reason for discontinuation was disease progression for both groups, and no patients stopped treatment because of side effects. At the median follow-up time of 14.0 months (IQR: 7.0–18.5), 19 deaths had been observed: 11 of 43 patients (25.6%) in the AA + prednisone group and 8 of 17 patients (47.1%) in the prednisone-alone group. PSA progression and radiographic progression were observed in the same number of patients in the AA + prednisone group (both 22 of 43 patients [51.2%]) and in the prednisone-alone group(both 17 of 17 patients [100%]). The median PSA PFS was significantly longer for the AA + prednisone group than the prednisone-alone group (10.3 months [7.7–12.9]vs 3.0 months [1.7–4.4],P < 0.001), as was the median rPFS (13.9 months [8.4–19.5]vs 3.9 months [3.0–4.4],P < 0.001), and the median OS (23.3 months [18.8–27.7]vs 17.5 months [13.2–21.8],P = 0.016) (Fig. 1). The PSA response rate (≥50% decline) of the AA + prednisone group (27 of 43 patients [62.8%]) was more than five times that of the prednisone-alone group (2 of 17patients [11.8%]). Table 1 summarises the survival outcomes of patients in the AA + prednisone and prednisone-alone groups. In the AA-prednisone group (n = 43), the median age was 67 years (63–76). Of the 43 patients, 35 (81.4%) had ECOG-PS scores of 0 or 1,and 8 (18.6%) had an ECOG-PS of 2. Gleason scores were available for all 43 patients; 15 (34.88%) had Gleason scores of < 7 and 28 (65.2%) had 8–10, respectively. The baseline PSA at treatment initiation was 41.5 (range 15.9–239) ng/mL. All 43 patients had confirmed metastases; 42 (97.7%) had bone metastases, 17 (39.6%) had lymph node involvement, and 1 (2.3%) had lung metastases. Eleven patients (25.6%)were symptomatic prior to initiation of AA + prednisone therapy. In the prednisone-alone group (n = 17), the median age was 67 years (62.5–74.5), 14 (82.4%) patients had ECOG-PS scores of 0 or 1, and 3 patients (17.6%) had ECOG-PS scores of 2. Seven patients (41.2%) had a Gleason score < 7 and 10 (58.8%) had scores between 8 and 10. The baseline PSA at treatment initiation was 46.6 (range 38–92.4)ng/dL. All 17 patients had confirmed bone metastases and 5 (29.4%)had lymph node involvement. As shown in Table 2, there were no significant differences in the clinical characteristics between patients in the AA + prednisone and prednisone-only groups in this study. From the ROC curve analysis of the association between OS and the time from ADT to castration resistance, the optimal cut-off value was 18 months (Fig. 2). In univariate analysis, four variables were significant determinants of PSA PFS and OS and three were significant determinants of rPFS (Table 3). Several covariates were important predictors of outcomes in the multivariate survival models (Table 4). Short time from ADT to castration resistance (≤18 months) was a significant determinant of OS (hazard ratio [HR] = 12.8, 95% confidence interval [CI]: 2.0–83.1, P = 0.007); ECOG-PS score (HR = 2.6, 95% CI 1.2–5.5, P = 0.012), baseline PSA level (HR = 4.9, 95% CI: 1.0–23.0, P = 0.043), and short time from ADT to castration resistance (≤18 months) (HR = 3.4, 95% CI: 1.2–9.4, P = 0.02) were significant determinants of PSA PFS; and ECOG-PS (HR = 3.3, 95%CI: 1.5–7.2, P = 0.003) was also a significant determinant of rPFS. The most frequently reported grade 3 or 4 AE(reported in ≥3% of patients) in the AA + prednisone group were elevated alanine aminotransferase (ALT) levels (5 patients [11.6%]), hypokalaemia (4 patients [9.3%]), and hyperglycaemia (2 patients[4.7%]). In the prednisone group, the most frequently reported grade 3 or 4 AEs (reported in ≥3% of patients) were elevated ALT (2 patients [11.8%]), hypokalaemia, (2 patients [11.8%]), and hyperglycaemia(1 patient [5.9%]). None of the AEs resulted in discontinuation of therapy (Table 5). The results of this study support the favourable safety and efficacy profile of AA for the treatment of Asian patients with chemotherapy-naive mCRPC. In addition, we observed that longer (≥18 months) duration of the ADT response was a significant determinant of survival of chemotherapy-naive mCRPC patients treated with AA. These results could serve to guide clinicians in determining whether patients with shorter (< 18 months) times from ADT to castration resistance might benefit more from chemotherapy than from AA. An international collaborative study (COU-AA-302) confirmed that AA was effective for the treatment of chemotherapy-naive mCRPC patients, and significantly improved rPFS and OS with an acceptable AE profile . In the current study, we demonstrated that AA is equally effective in the treatment of chemotherapy-naive mCRPC of Chinese ethnicity. To our knowledge, this is the first report of the long-term (follow-up > 12 months) efficacy and safety of AA in the treatment of Asian patients with chemotherapy-naive mCRPC. The median OS and rPFS of our AA cohort (23.27 and 13.93 months, respectively) were shorter than those in the COU-AA-302 trial (34.7 and 16.5 months, respectively)  (Table 6). In this regard, a recent study reported a median OS of 18.1 months for chemotherapy-naive Asian mCRPC patients treated with AA, which is much shorter than the 34.7 months reported in the COU-AA-302 study . Furthermore, a recent publication described the results of a bridging study of Asian patients in a randomised, double-blind, placebo-controlled phase 3 clinical trial of AA for mCRPC after docetaxel failure . That study demonstrated a median PSA PFS of 5.5 months after treatment with AA + prednisone, which was also inferior to the PSA PFS outcome in the COU-AA-301 trial (median 8.5 months) . We postulate that inclusion of chemotherapy-naive patients with poor prognostic features in our study could have accounted for the unsatisfactory survival results compared with the COU-AA-302 trial. Of note, in our study, chemotherapy-naive patients with an ECOG-PS score of 2, who were specifically excluded in the COU-AA-302 trial, had significantly inferior survival compared with patients with COG PS 0 and 1. The relative infrequency of post-AA treatment of our patient cohort compared with the COU-AA-302 trial cohort (11.6% versus 67% of patients, respectively) might also have contributed to the shorter survival time reported here (Table 7). Finally, the fact that our patient cohort included symptomatic patients, whereas the COU-AA-302 trial included only asymptomatic or mildly symptomatic patients, could also be a reason for the inferior survival in our study. In the COU-AA-302 study, dose reduction and discontinuation because of treatment-related AEs were 7 and 7% of patients, respectively . Patients In our study experienced very few AEs overall, and none resulted in discontinuation of drug therapy. Although the AEs may have been surveyed less vigorously in our study compared with clinical trials, AA appeared to be well tolerated by the Asian patients comprising our study. In the present study, multivariate analysis indicated that shorter time (< 18 months) between ADT and castration resistance predicted worse survival outcome in the patients treated with AA + prednisone. Indeed, Cox regression analysis demonstrated that this was an independent prognostic factor for both OS and PSA PFS. Data from an earlier study showed that the duration of prior ADT is an independent prognostic factor for OS of chemotherapy-naive mCRPC patients(P = 0.002) . However, the time from ADT to castration resistance is probably a better reflection of sensitivity to ADT. We should note that duration of prior hormonal therapy (HT) was defined as the total time to castration resistance plus the time with castration resistance on HT. Studies of other HTs suggested that a short response to first-line ADT predicts a poor response to subsequent HT [20–22]. In a retrospective study of 436 patients with CRPC treated with secondary HT, the median duration of secondary HT treatment was longer for patients who received primary ADT for > 24 months than for those who received primary ADT for < 24 months (P < 0.0001) . In addition, a report of 61 patients with chemotherapy-pretreated CRPC who were treated by AA revealed that duration of the ADT response was an independent predictor of OS(P = 0.006) . This is consistent with a European consensus statement that short duration of ADT response could identify patients with increased risk of primary resistance to AR pathway-targeted therapies . Polymorphisms in genes in the androgen metabolic pathway were reported to be significantly associated with time to progression on ADT, suggesting that shorter time to castration resistance may be associated with poorer response to ADT rather than to chemotherapy. This might also explain how the duration of response to previous ADT may influence the prognosis of CRPC patients treated with AA [24, 25]. Azad et al. studied the prognostic significance of ECOG-PS and found that it was a significant predictor of PFS (P = 0.043), OS (P < 0.001), and PSA decline (P = 0.002). Our results showing that ECOG-PS was a significant determinant of rPFS and PSA PFS are consistent with that study. It is interesting to note that treatment with AA early in the disease course may contribute to better survival. Considering the results of our multivariate analysis showing that ECOG-PS score was a significant determinant of both rPFS (HR = 2.606, P = 0.012) and PSA PFS (HR = 3.379, P = 0.02) and that baseline PSA level was a significant determinant of rPFS (HR = 4.914, P = 0.043), we postulate that better physical status may contribute to better survival outcomes of mCRPC patients treated with AA. We also found that just as comparative experimental results between COU-AA-301 trial and COU-AA-302 trial [10–13], the survival outcome of patients in our study was superior to that of Asian mCRPC patients treated with AA after docetaxel failure  in spite of being lack of OS because of short follow-up period (12.9 months) and limited number of observed death events (PSA PFS 10.27 months vs 5.5 months). These findings strengthen the rationale for the use of AA early in the clinical course of Asian mCRPC patients. The study had some limitations. First, this study was a retrospective study which had a small sample size and was completed at a single centre. However, we consider this limitation would not influence the ability to capture the real survival outcome of AA in this study. Second, the number of patients in the AA + prednisone and prednisone-alone groups were unequal, which may have biased the results. Finally, the follow-up time was short and we do not know if the inferior survival outcomes reported here will continue at later follow-up times. In addition, another follow-up study will be planned in the future to evaluate the effect of sequential therapies. The prognostic factors identified here should be validated, and we encourage others to continue the analysis of patients with mCRPC in different treatment settings, such as second-line chemotherapy, enzalutamide, or radium-223, for example. Such studies will aid in the development of optimised therapy sequences. Additionally, identifying patient subgroups who obtain the most benefit from AA could be important in maximising its cost-effectiveness [27–30]. The AA plus prednisone treatment significantly prolonged PSA PFS, rPFS and OS in Asian patients with chemotherapy-naive mCRPC. The tolerance of patients was satisfactory and it is an effective and safe option for treating chemotherapy-naive mCRPC patients. Longer duration of ADT response was significantly associated with longer survival of chemotherapy-naive mCRPC patients treated with AA. This might help guide the selection of the best therapy for mCRPC. Liancheng Fan, Baijun Dong, Chenfei Chi, Yanqing Wang and Yiming Gong contributed equally to this work. This study was supported by National Natural Science Foundation of China (91129725,81572536), Science and Technology Commission of Shanghai Municipality (14140901700), the Joint research foundation of Shanghai Shenkang hospital development center on innovative medical technology (SHDC12015125), Shanghai Municipal Education Commission(15ZZ058), Shanghai Municipal Education Commission-Gaofeng Clinical Medicine Grant Support (20152215), Key Disciplines Group Construction Project of Pudong Health Bureau of Shanghai (PWZxq2014–05), and the Shanghai Jiao Tong University School of Medicine Translational Research Innovation Fund (15ZH4002). The data generated or analysed during this study are included in this published article and its supplementary information file. Additional raw data are available from the corresponding author on reasonable request. LF, BD, CC and YW carried out this study, participated in the statistical analysis and drafted the manuscript. WX and LZ participated in the design of the study and performed the statistical analysis. JS, JP, XS and YH contributed to acquisition of data and interpretation of data. All authors read and approved the final manuscript. Approval for this study was obtained from the Committee for Ethics of Renji Hospital. Sixty patients with chemotherapy-naive mCRPC provided informed consent and were enrolled in our study.